By the end of this month, it’s a safe bet that we’ll be seeing many nights below freezing, and it’s possible that temperatures will drop into the teens. The brief arctic summer is over! As we batten down for the approaching arctic winter, we thank you for your financial support and your prayers. We are sincerely grateful to you. Thank you! 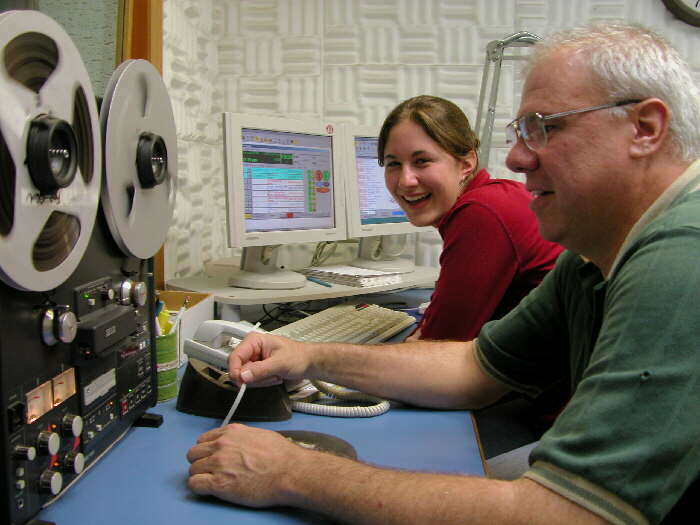 GOLDEN OLDIES (left): In Studio B, program director Ric Schmidt instructs volunteer Anna Dummer how to use an ancient machine: a tape recorder! Part of Anna’s job this year is to archive historic tape from KNOM’s past. We have hundreds of hours of tape, much of which is deteriorating. From Lansing, Michigan, Anna served as music director last year and has embarked on her second volunteer year for the mission. St. John’s University/College of St. Check www.knom.org/volunteer/volfairs.html for the latest times and schedules, and possibly more college dates. KNOM is the oldest Catholic radio station in the United States, serving the people of isolated villages scattered throughout 100,000 square miles of western Alaska, as well as a thousand miles of Russian coastline�thanks to you. INSPIRATIONAL SPOT: We don’t have to scheme and labor to have God present in our daily lives. He is already present, waiting to be discovered. CONSOLING OURSELVES (left): KNOM news director Paul Korchin inspects a new audio mixing console which Tom Busch is about to install in the newsroom � its first major upgrade in eleven years. The new mixer has more inputs and more flexibility. It’s a low-end unit from a high-end company. TROUBLING: In August, KNOM reported on a troubling report released by the Alaska Native Tribal Health Consortium. According to the group, while Lower 48 cancer death rates declined during the 1990’s, cancer death rates among Alaska Natives increased. Sixty years ago, cancer did not kill many Alaska Natives. For the most part, people died of infectious diseases. For example, in the 1940’s, 43% of all Alaska Native deaths were due to tuberculosis. By the 1990’s, cancer had become the leading cause of death. Why? Smoking, prevalent in villages is one factor. Another may be the impact of western foods such as flour and sugar, which are recent arrivals. Another may be arctic pollution. And travel can be expensive. Round-trip air fares from some villages to Anchorage can run as high as $1,800, says the report. The group is developing a statewide plan that will address prevention, early detection and treatment. Please remember missions like KNOM in your will. For many of us, it will be the largest gift we ever make. At KNOM, we prayerfully place all bequests into funds that provide for emergencies and for major improvements. INSPIRATIONAL SPOT: I once broke my leg, Lord, and the doctors fixed me up good as new. But Lord, someone I deeply loved has badly hurt me, and I have found no one to help me heal and learn to forgive. And so, I come to you, Lord. Please help me heal, make me whole again inside. MEET KATIE RINGENBACH (left): A KNOM volunteer news reporter, Katie is a 2004 graduate of the University of Dayton, majoring in sociology and history. 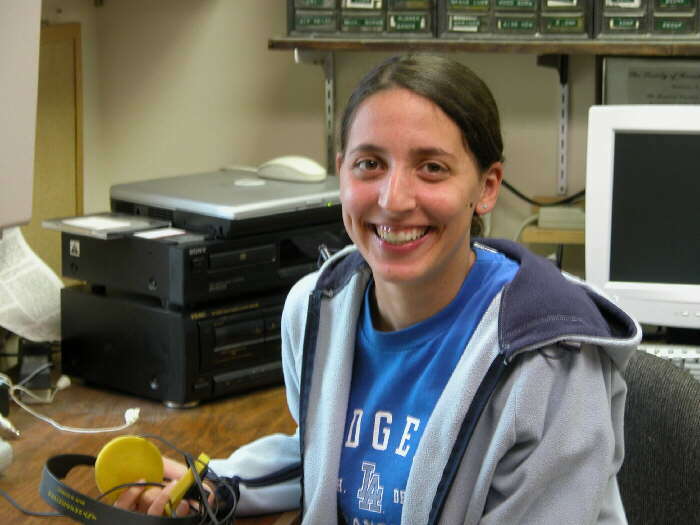 This picture captures her editing audio at a computer work station set up in the station’s engineering shop. From Columbus, Ohio, Katie is an avid reader, “and being so far from home, I write a lot of letters.” She loves baseball, and is a loyal fan of the Cleveland Indians. Welcome, Katie! NOME ROCKS: This summer, the Army Corps of Engineers has been working to extend a breakwater in the Nome harbor and make other improvements. From a quarry twelve miles away, 105-foot-long trucks have been hauling immense rocks 16 hours a day, stockpiling them in huge piles on the beach. The largest rocks weigh in at 56,000 pounds. They are huge! THANK YOU, ANONYMOUS! Twelve years ago, ten percent of our studio building’s construction was paid by two anonymous contributions of $20,000 each, given by the same person. Anonymous, we still think of you and pray for you. Thank you, from the bottom of our hearts. A MOVING STORY: It won’t happen for a while, but Tom Busch has announced that after nearly thirty years, he will step down as KNOM general manager, to be replaced by Ric Schmidt. “Florence and I have been planning a move to Anchorage for five years,” Tom says, “and we see this as good for us as well as for KNOM.” Bishop Donald Kettler has granted his approval. INSPIRATIONAL SPOT: In our journey to heaven, going out of our way to help someone else is not considered a detour. It may be the main road. 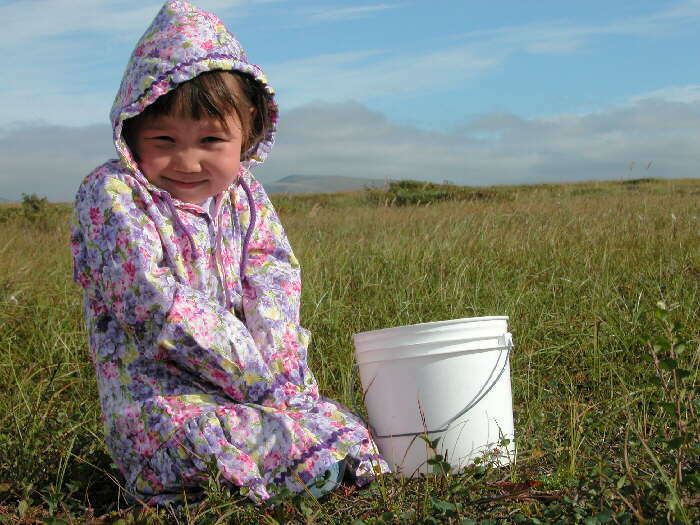 “BERRY” PICKY (left): 4-year-old Ariana Paukan helps her mom pick blueberries on the tundra near Nome. Born the day before the death of Bishop Mike Kaniecki, SJ, she was named “Little Bishop” in his memory, according to Yup’ik tradition. Wild blueberries are a staple of rural Alaskans’ diet. A family may freeze many gallons for the winter. THIRTY YEARS AGO: In September 1974, a new satellite earth station allows Nome to receive network broadcasts for the first time. 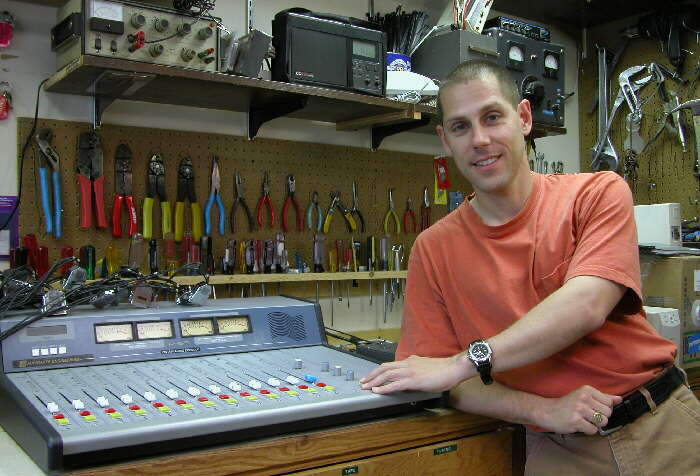 Former KNOM volunteers are working at Mutual Radio Network affiliates in Anchorage and Fairbanks, and thanks to that connection, KNOM has access to what they receive, four Mutual newscasts each day. Other hours that year, KNOM continues to use the Associated Press teletype to provide national and international coverage, which are mixed with state and local stories in the station’s five-minute newscasts. It will be fifteen months before KNOM receives the Mutual network full time. NOT ALL FIRED UP: Tundra fires plagued the eastern part of Alaska during the summer. While Nome endured smoky skies from blazes five hundred miles distant, our summer was a wet one. By August 12th, we had already experienced the wettest August on record. CAN YOU TRANSLATE THAT? The wheels of the Federal Communications Commission turn slowly. We’re still awaiting the go-ahead to construct thirteen village translators, which will transmit a strong KNOM signal into places where the station is heard poorly, or not at all. When will that day arrive? No one can say. When the time comes, we’ll be asking you for help. We estimate that the installation cost for each translator will be around $5,000, and each will require about $8,000 per year in satellite expenses. Again, we thank you most sincerely for your kindness to the thousands of remote families whom we serve. At every staff meeting we pray for you and for your intentions, and we keep you in our own daily prayers, too. Until next time, may Our Lord keep you close to Him. God bless you.